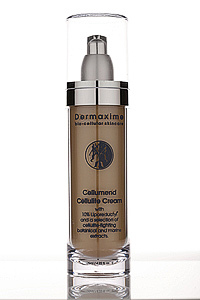 Butcher's broom - Ruscus aculeatus in Cellumend - the cream that prevents cellulite. This is a dense dark shrub with thick oval false leaves that grows to a height of 75 - 120 cm and it is found in woods and bushy places as well as dry hills in Europe, North Turkey, North Africa and the Azores and is part of the Liliaceae family. 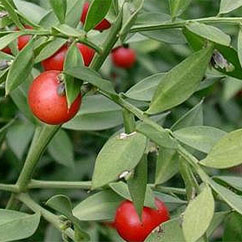 The name Butcher's Broom (Ruscus aculeatus) is derived from the fact that the branches were bound in bundles and sold to butchers to sweep their cutting blocks. The young shoots of the plant can and was eaten much like asparagus to which it is botanically closely aligned. It is also known as Box Holly and 'Jew's Myrtle' which refers to the use of this herb during the Feast of Tabernacles. Another name by which it is known is Pettigree. Butchersbroom extract acts mainly on the microcirculation, decreasing capillary permeability due to its content of a flavonoid called Rutin. The therapeutic properties of this plant are to increase circulation, reduce edema, reduce swelling and to act as an anti-inflammatory and the extract has been used with good results in the treatment of varicose veins.